Chances are, you've been to other weddings recently, right? And they were nice - maybe even really nice... But they were an awful lot the same too, weren't they. How much different will they seem in 10 years? 25 years? 50 years? That's right - they'll all blend together, making it hard to remember what went on at which one. Shame, isn't it? So now what about YOUR event? It's one of the most important days in your life, one you'll remember for all your days. After all, how could you forget with all those lovely photos you'll have? But you're SPECIAL, right? An the person you're marrying is too. So why should you have to settle for the same wedding as your friends, just one more event to mix into the blur of memories over time? Don't you deserve better? 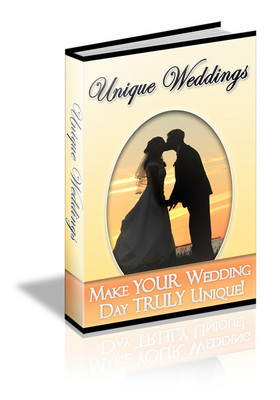 YOUR Wedding Day TRULY Unique! Fortunately, you don't need to wait - we've put this powerful ideas guide into electronic form as a PEF e-book, readable by the same Adobe software already installed on almost every computer. And if your computer doesn't have it yet, not to worry - the Acrobat Reader is a free download from Adobe's website. PS - Sure, you can settle for a plain, common wedding - just like every other wedding you've ever attended. Or you can have a fantastic event that will even impress your in-laws, and have people talking about it for years! You're not plain, boring and unexciting, so why settle for a wedding that is? Go ahead and download this exciting guide right now! Customer Support Made Easy-Set Up Your Own Support System!